Not MAC Compatible via USB. The Omano OM136C is a classic microscope - and for good reason. It is packed with professional features while being constructed to last a lifetime. Such features combine to make it both easier to use and provide enhanced viewing a and start with an ergonomic 30° microscope head that rotates 360° and rack and pinion focusing with coaxial coarse/fine focus controls which make it easier for young fingers to focus. The standard rack stop and slip clutch prevents slide or microscope damage and an improved 6V 20W halogen or LED offers shadow-free illumination. A WF10x/23 eyepiece and three, parfocal, parcentered achromatic objectives yield magnification settings of 40x, 100x and 400x. 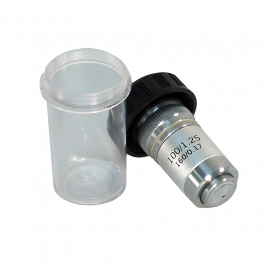 The objectives are set in a click stop, rear-facing nosepiece that enables more convenient slide handling; an optional 100xS oil immersion objective can be added at a discounted price when bought with the microscope - as can a mechanical slide holder. We recommend the slide holder since it makes it materially easier to maneuver slides precisely. The microscope also includes a professional 1.25 N.A Abbe condenser with iris diaphragm and filter holder for ideal light control. The stage measures 125mm x 110mm with two spring-loaded stage clips to retain the slide. Illumination is available in either 6V 20W halogen or rechargeable LED with variable control. Accessories include head adjustment tool, dust cover and manual. The Omano OM136L is a classic microscope - and for good reason. It is packed with professional features while being constructed to last a lifetime. Such features combine to make it both easier to use and provide enhanced viewing a and include ergonomic 30° microscope head that rotates 360° . Standard rack and pinion focusing with coaxial coarse/fine focus controls make it easier for young fingers to focus, and a rack stop and slip clutch prevents slide or microscope damage. LED illumination provides convenient portabilty while a WF10x/23 eyepiece and three parfocal, parcentered achromatic objectives yield magnification settings of 40x, 100x and 400x. Book: "The World of the Microscope"
Usborne's The World of the Microscope is, in our opinion, a wonderful and colorful introduction to microscopy. Practical, clearly worded and illustrated, it provides numerous experiments and activities that range from simple to more complex. While many assume the book is aimed at children, we have found it to be an useful primer for both young and old alike. We highly recommend it. 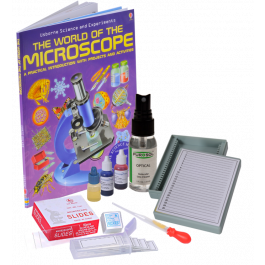 Pack 2 includes everything you need to get started with your compound microscope. 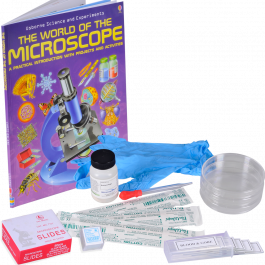 It includes our popular blank slide starter kit, Eosin Y and Methylene Blue stains, lens cleaning fluid and the excellent World of the Microscope book from Usborne. Eosin Y is used for vegetable specimens while while Methylene Blue is used for animal specimens. The World of the Microscope is a wonderful guide to microscopy. The book is packed full of colorful illustrations on hundreds of interesting experiments and we recommend it not just for children but also for amateur adult microscopists. The Perfect Microscope Accessory Gift! 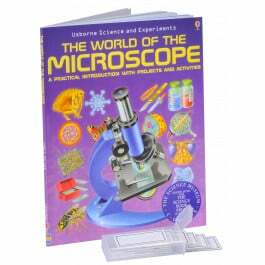 The Perfect Microscope Accessory Gift for your young scientist! This student microbiology experimentation and study kit has everything you need to grow your own bacteria cultures. Experiment with bacteria in the air, on your hands and more, with help from the included, "World of the Microscope" book, a wonderful student guide to microscopy. This book is packed full of colorful illustrations on hundreds of interesting experiments. Your microbiology kit also includes 5 professionally prepared slides inspired by a permanent exhibition at The Natural History Museum in London to fire the imagination of children - and adults alike. 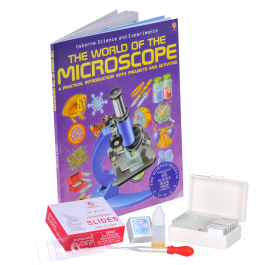 One of our most popular microscope accessory kits now includes a Slide Kit, 15 Prepared Non-Animal Slides and the book, "The World of the Microscope". 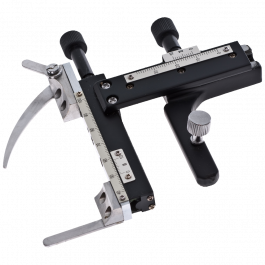 Ergonomic knobs allow for fine-tuning the position of your specimen while graduated measurements along both X/Y axis provide precise location settings for reference. Simply place your slide in position, secure it with the spring retaining arm and enjoy smooth, positive movement along the entire 57mm x 32mm travel in the X-Y axis. An industrial-grade finish and precision-machined, stainless-steel components ensure years of satisfying performance. Fits the Omano OMTM85, OM118-M3 and OM136 microscopes. 100x Achromatic, Spring, Oil, DIN compatible objective for compound microscopes. The new KoPa AIR offers both WiFi and USB live image output with up to 5.0 megapixel USB resolution, and live (40 FPS) streaming WiFi at 1280 x 960 resolution. The camera has a full suite of auto and manual controls in the USB software as well as the free, downloadable KoPa Vision App. The camera works well in USB mode, and really excels in its WiFi capability. On-camera control consists of a switch on the back (Off/USB/WiFi) which places the unit into USB or WiFi mode. After downloading the App, it is a process of connecting your mobile device to the Kopa network in the WiFi settings on your device. The antenna is internally-located for security and to optimize the WiFi signal performance in industrial environments. USB output operates via a user-friendly, Windows-only software suite that includes measuring software among a host of other features. WiFi output operates via a free, downloadable App. The refresh rate ranges from 15fps at 2592 x 1944 (maximum resolution) to 40fps at 1280 x 960. 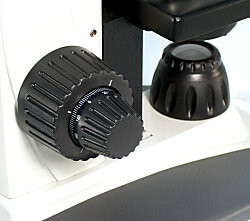 The camera features a standard C-mount interface to fit any microscope with a C-mount adapter. In addition, the camera has a tripod mount on the base, allowing for use as a stand-alone imaging device (with a C-mount standard macro or zoom lens fitted). As a major upgrade over the C500W, the KoPa AIR camera also features a 5000mAh lithium Ion battery, capable of operating 8 hours on a full charge. The software offers a comprehensive range of features including measuring software, drawing tools and annotation. Adjustable parameters include white balance, exposure, saturation, brightness, contrast, sharpness and backlight compensation among others. The App has simple touch screen buttons with both still and video capability as in USB mode. Image format include: jpg, png, bmp and pdf. NOTE: This software is not MAC compatible. 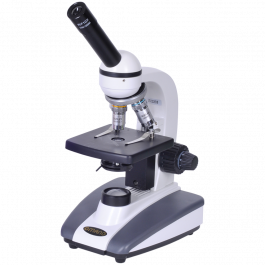 The Omano OM136C monocular compound microscope is one of our best-selling school microscopes and more than merits our Best-Rated award. 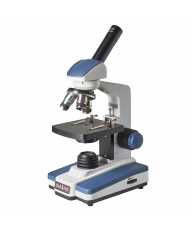 As our most popular school microscope, it is ideal for this offering and will last a lifetime of classroom use. Recommended for Grades 5-12. 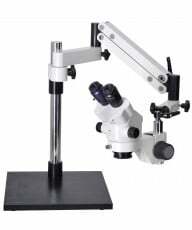 The Omano OM136C-L includes a monocular microscope head that is inclined at an ergonomic 45 degrees. The head rotates through 360 degrees for flexible viewing. A single wide field WF 10x eyepiece combines with three parcentered, coated, 160mm achromatic objective lenses (4x, 10x, 40x Spring), to provide magnification levels of 40x, 100x and 400x. The objectives are set in a quadruple nosepiece so that an optional 100x oil immersion objective can be added for maximum magnification of 1,000x. The condenser is a professional Abbe 1.25 N.A with included iris diaphragm and filter holder for optimal adjustments. Illumination is 6V 20W transmitted halogen or rechargeable LED, both with variable light intensity. 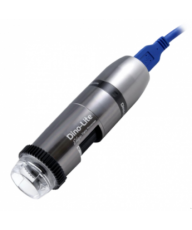 The LED version requires a 30-minute charge to last all day long and is a popular microscope for field work. Dust Cover, Manual. 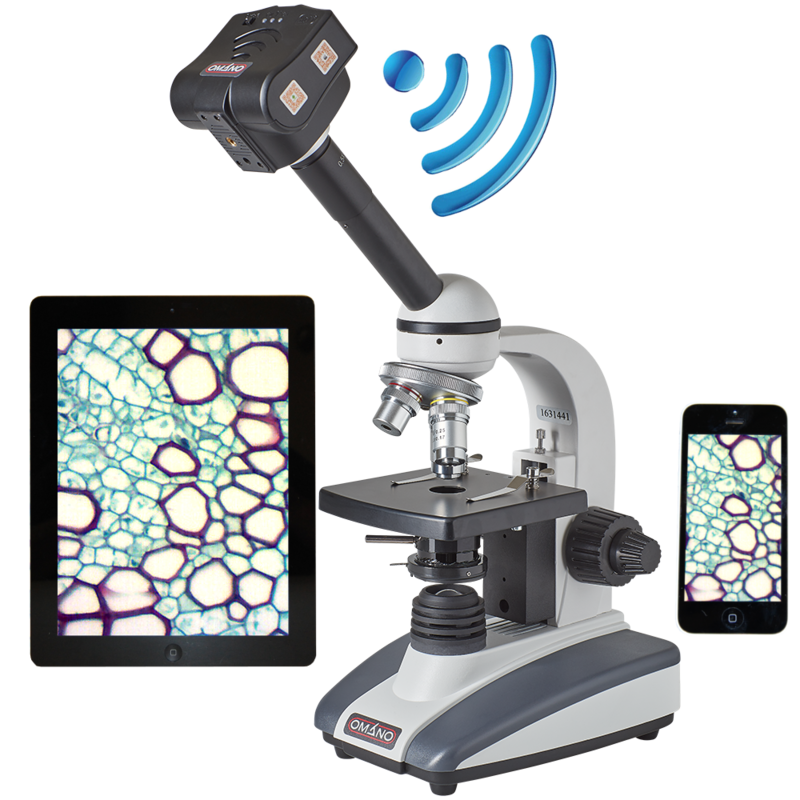 Save over 40% when you purchase the optional 100x objective with the microscope. Shipping Wt. and dimensions: 12 Lb. 22"x14"x12". WiFi camera, 23mm 0.5X C-mount adapter, Charging adapter, USB cable, software CD, padded storage case. Camera dimensions: 60mm diameter, 70mm height, 0.41 Lbs. Case dimensions: 9" wide, 8" deep, 6" tall. Summary The new KoPa AIR offers both WiFi and USB live image output with up to 5.0 megapixel USB resolution, and live (40 FPS) streaming WiFi at 1280 x 960 resolution. The camera has a full suite of auto and manual controls in the USB software as well as the free, downloadable KoPa Vision App. The camera works well in USB mode, and really excels in its WiFi capability. 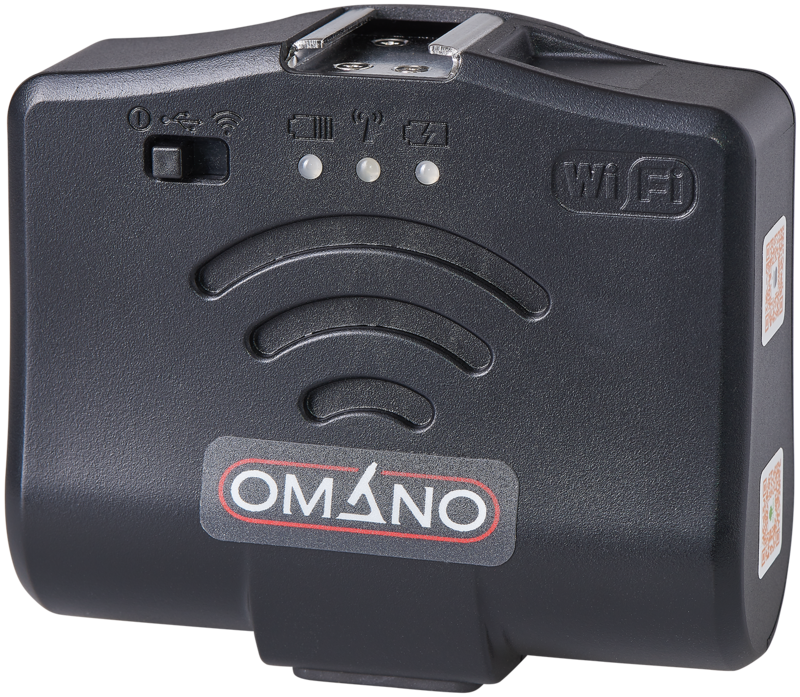 Controls & Operation On-camera control consists of a switch on the back (Off/USB/WiFi) which places the unit into USB or WiFi mode. After downloading the App, it is a process of connecting your mobile device to the Kopa network in the WiFi settings on your device. The antenna is internally-located for security and to optimize the WiFi signal performance in industrial environments. USB output operates via a user-friendly, Windows-only software suite that includes measuring software among a host of other features. WiFi output operates via a free, downloadable App. The refresh rate ranges from 15fps at 2592 x 1944 (maximum resolution) to 40fps at 1280 x 960. 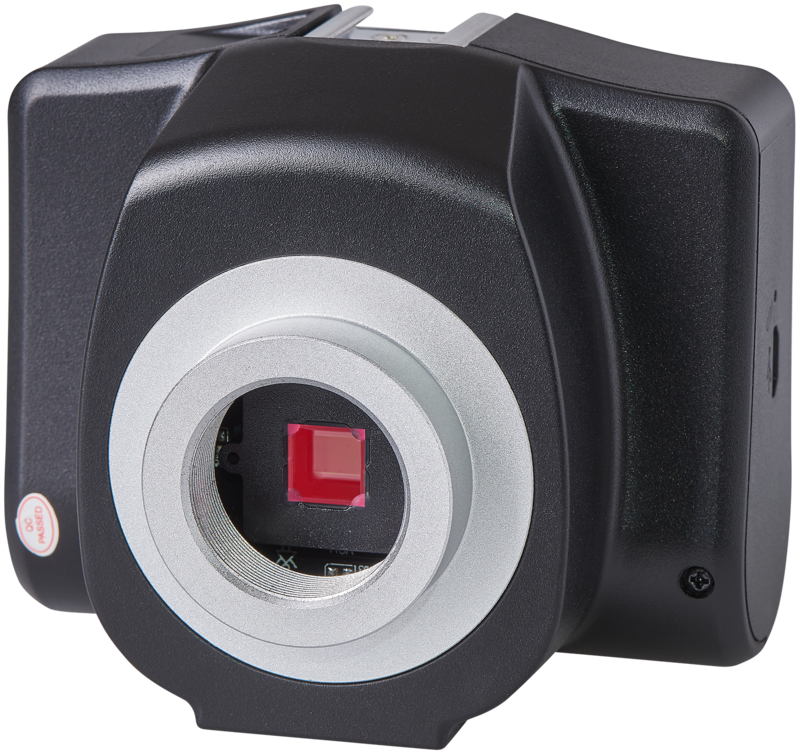 The camera features a standard C-mount interface to fit any microscope with a C-mount adapter. In addition, the camera has a tripod mount on the base, allowing for use as a stand-alone imaging device (with a C-mount standard macro or zoom lens fitted). As a major upgrade over the C500W, the KoPa AIR camera also features a 5000mAh lithium Ion battery, capable of operating 8 hours on a full charge. Kopa Cam Software The software offers a comprehensive range of features including measuring software, drawing tools and annotation. Adjustable parameters include white balance, exposure, saturation, brightness, contrast, sharpness and backlight compensation among others. The App has simple touch screen buttons with both still and video capability as in USB mode. Image format include: jpg, png, bmp and pdf. NOTE: This software is not MAC compatible. 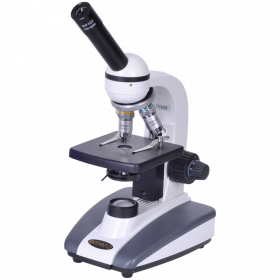 OM136 Microscope The Omano OM136C monocular compound microscope is one of our best-selling school microscopes and more than merits our Best-Rated award. 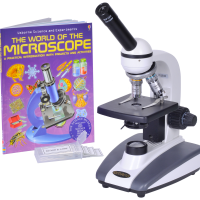 As our most popular school microscope, it is ideal for this offering and will last a lifetime of classroom use. Recommended for Grades 5-12. 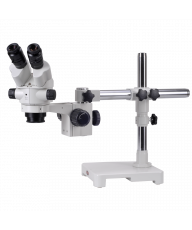 Optics The Omano OM136C-L includes a monocular microscope head that is inclined at an ergonomic 45 degrees. The head rotates through 360 degrees for flexible viewing. A single wide field WF 10x eyepiece combines with three parcentered, coated, 160mm achromatic objective lenses (4x, 10x, 40x Spring), to provide magnification levels of 40x, 100x and 400x. The objectives are set in a quadruple nosepiece so that an optional 100x oil immersion objective can be added for maximum magnification of 1,000x. Condenser & Illumination The condenser is a professional Abbe 1.25 N.A with included iris diaphragm and filter holder for optimal adjustments. Illumination is 6V 20W transmitted halogen or rechargeable LED, both with variable light intensity. 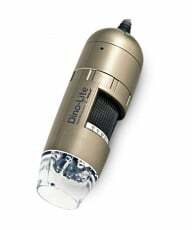 The LED version requires a 30-minute charge to last all day long and is a popular microscope for field work. Microscope Accessories Dust Cover, Manual. Save over 40% when you purchase the optional 100x objective with the microscope. Wt. and dimensions: 12 Lb. 22"x14"x12". Camera Accessories WiFi camera, 23mm 0.5X C-mount adapter, Charging adapter, USB cable, software CD, padded storage case. Camera dimensions: 60mm diameter, 70mm height, 0.41 Lbs. Case dimensions: 9" wide, 8" deep, 6" tall.